I found this to be an extremely difficult story to rate, let alone review adequately. What made it more difficult were the great expectations I had for Detained, the premise was very compelling and I have a great fondness for Australian writers and/or stories set in that region of the world. Coupled with the episodes I have seen and been traumatized by, of Locked Up Abroad and Border Security on the National Geographic channel, before I had even begun the story I was having visions of a tale along the lines of Brokedown Palace meets A Town Like Alice. What I found instead was more along the lines of Fifty Shades of Grey Shanghai edition initially, which was unexpected. Confined in a cold, dull room in the depths of a Shanghai airport, a journalist chasing a career break and a businessman with a shadowy past play a game of truth or dare — deliberately not exchanging names. They tell each other their most painful secrets and burning desires. One dare leads to a kiss and a wild night of illicit passion, setting off a dangerous sequence of events, bringing exposure and disgrace. You know what they say about expectations paving the way to hell…it was actually “intentions” but you get my meaning. Detained starts slowly, I even considered abandoning it around a quarter of the way through, when it appeared that Darcy came precariously close to suffering from a possibly story killing case of “stupid heroine syndrome”. However, Ms Paton’s excellent writing and abruptly twisting plot pulled me back from the precipice. Suddenly, a somewhat pedestrian, predictable exploration of this cub reporter and the businessman’s, she was supposed to interview, game of truth or dare transformed into a labyrinth-like yarn of lust, lies and loyalty. When Darcy Campbell is detained at the Shanghai airport on the way to her career making interview with reclusive Australian billionaire Will Parker she is concerned but is reassured when immediately after another traveler is sequestered with her. Their idle conversation becomes more and more intimate as the hours pass and before long they are revealing the most private details of their lives with the exception of their respective identities. This sharing gives way to passion and upon their release from detention their idyll carries over to a sumptuous suite at one of Shanghai’s most exclusive hotels. On the morning of her interview Darcy is disappointed but not surprised to wake alone. Upon arriving at the appointed time Darcy is informed that her quarry is no longer available and the interview has been cancelled. Her suspicions finally roused Darcy realizes that her fellow detainee was none other than Will Parker and not the man identified in what few photographs were available of the reclusive businessman. Faced with the untenable prospect of returning to Australia empty handed Darcy devises a plan to at least obtain photographic evidence of Will’s true identity. It was at this point that the plot literally exploded into unrelenting action worthy of a movie. Pain exploded in Darcy’s hand and inside her eyes. She spun away from him, tucking her hand into her chest, gasping at the shock of what she’d done. She’d never hit anyone and now she’d hit one of Australia’s richest men. 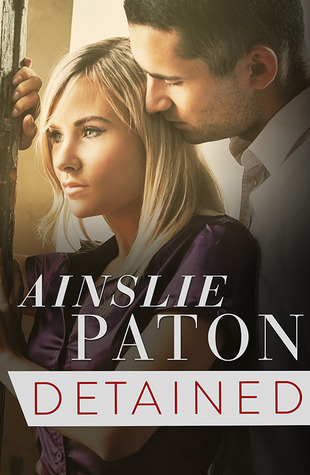 While I would ultimately state that I enjoyed Detained I found myself questioning the veracity of a true love between these characters with the sheer amount of lies and betrayal between them, not to mention a boat load of emotional baggage on both their parts. The secondary man heavy cast of characters was rather undeveloped and almost unrelentingly antagonistic toward Darcy, making me wonder why she didn’t just chuck the lot of them and relocate to climbs more amenable. That being said once engaged with this story Ainslie Paton served up a gripping, very readable tale that will have many readers clamoring for more. Disclaimer: ARC was kindly provided by the publisher for an honest review.